2.) Choose a purpose built small batch inductor and enhance your circuit’s performance and reliability. When you’re ready for high performance and reliability, Osborne’s small batch transformers and inductors are exactly what you’re looking for. It’s time to discover why so many engineers love the quality of Osborne’s hand-crafted electromagnetic components. 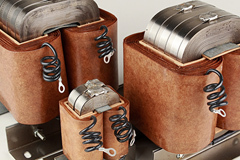 Every one of Osborne’s small batch transformers and inductors are built to order. When you compare a batch produced inductor to a mass produced inductor, you can immediately see the difference in craftsmanship and attention to detail. Osborne’s transformers and inductors are the best in the world. That’s no exaggeration. In the pursuit of world class results, Osborne’s design engineering department is focused exclusively on high performance and extreme reliability. Instead of searching out bargain deals on the cheapest raw materials, Osborne is busy evaluating the best materials that money can buy. Instead of accepting that cut-rate parts will only perform for 10 years, Osborne challenges their team to deliver transformers that can 50 years or longer. Instead of forcing your circuit to adapt to the sloppy performance of a mass-produced part, Osborne’s small batch inductors are hand-crafted using time honored assembly techniques. Instead of relying on automated testing devices, Osborne’s technicians subject every single component to multiple stages of the most rigorous electrical performance testing. Osborne’s small batch components are built to such high standards that they’re truly unlike any commodity inductor you’ve ever worked with. Osborne’s unmatched success in responding to uniquely demanding circuit design challenges. Ready to talk about your project? Call Osborne at 800-229-9410, or email them at sales@OsborneTransformer.com.